Bill Fernandez and his family have contributed a great deal to the island community through the years. Both of his parents were half Native Hawaiian. His father was raised on Mau'i and Parker Ranch. His mother, Agnes Scharsch, cames from an old family on the island. In the 1920s and 30s, Bill's father was a pioneer showman traveling on horseback with his projector strapped to his back from one plantation town to another throughout all of the islands, showing motion pictures in plantation camps. He went as far away as the Far East to show films. Then he settled in Kapa'a where he built Roxy Theater and married Agnes. He served in the Territorial Legislature. Bill served on the Sunnyvale, CA, city council and as Mayor. He was appointed to the Economic Opportunity Council in Santa Clara County, CA. He was appointed to the Santa Clara County,CA, Municipal and Superior Courts. After retiring, he returned home where he and his wife work on books, photography, and count waves. Recently, he was appointed by the governor of Hawaii to the State Juvenile Justice Advisory Council. A graduate of Kamehameha Schools and Stanford University School of Law, Bill has a keen interest in legal issues affecting Native Hawaiians. He serves as Policy Chair for Council of Native Hawaiian Associations (CNHA). 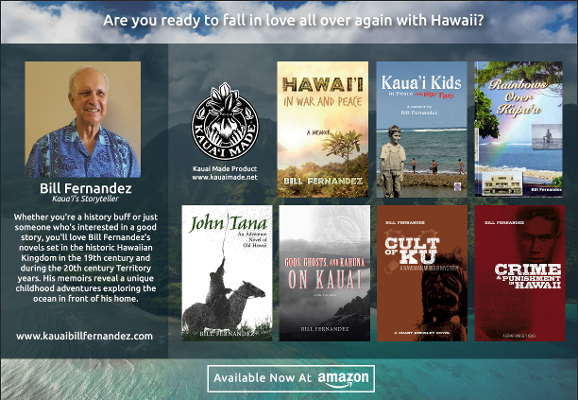 Both of Bill's books, Hawai'i in War and Peace, Kauai Kids in Peace and War, and Rainbows over Kapaa can be purchased at Kepler's Book Store and from their website. November 17 at 7:30 PM, Bill will give a book talk. Call to confirm. Hawaiian Chamber of Commerce, Northern California. Hawaii Traveler Magazine. An article about the memoir "Rainbows Over Kapa'a" can be found in this publisher's Kaua'i Traveler Magazine Jan. 2010 issue. Both "Kauai Kids in Peace and War" and "Rainbows Over Kapaa" can be purchased at Amazon.com and kindle. Native Books Hawaii in Honolulu sells beautiful Hawaiian crafts and books. Ask for Bill's books - "Kauai Kids in Peace and War" and "Rainbows over Kapaa". Also available online. Facebook Home Page of Kamehameha Schools Alumni Association, Northern California. The Kauai Economic Council program recognizes authentic Kauai produced items after a review of the products. The Hawaii Tourist Bureau features them. Tourists know they can be confident in their purchases. 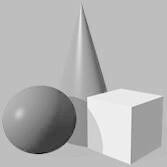 Look for the logo.